This chapter describes how to create both ADF Mobile application-level and application feature-level user preference pages. Section 13.1, "Creating User Preference Pages for an ADF Mobile Application"
Section 13.2, "Creating User Preference Pages for Application Features"
Section 13.3, "Using EL Expressions to Retrieve Stored Values for User Preference Pages"
Section 13.4, "Platform-Dependent Display Differences"
Section 13.5, "Creating a Preference for the Configuration Service URL"
Preferences enable you to add settings that can be configured by end users. Within both the adfmf-application.xml and adfmf-feature.xml files, the user preference pages are defined with the <adfmf:preferences> element. As shown in Example 13-1, the child element of <adfmf:preferences> called <adfmf:preferenceGroup> and its child elements define the user preferences by creating pages that present options in various forms, such as strings, dropdown menus, or in the case of Example 13-1, as a child page that can present the user with additional options for application settings. 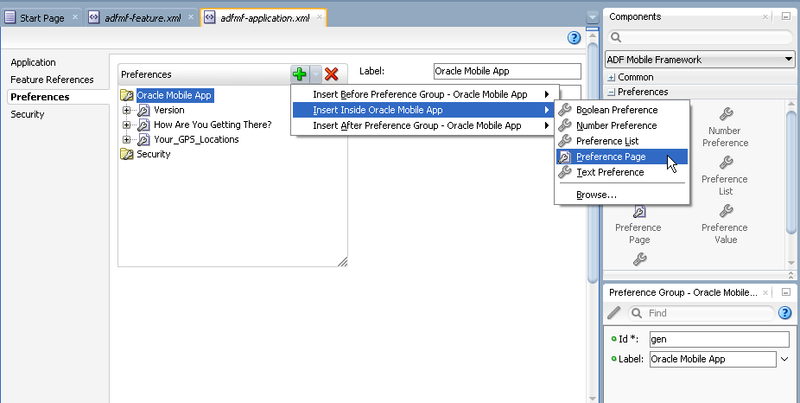 You also use the <adfmf:preferences> element to create the preferences that users manage within each application feature. Figure 13-1 shows an example of how opening child user preferences page can offer subsequent options. <adfmf:preferencePage>—Specifies a new page in the user interface. <adfmf:preferenceList>—Provides users with a specific set of options. <adfmf:preferenceValue>—A child element that defines a list element. See Oracle Fusion Middleware Tag Reference for Oracle ADF Mobile Tag Documentation for more information on these elements and their attributes. The PrefDemo application is comprised of an application-level settings page as well as three application feature preference pages, which are implemented as ADF Mobile AMX. 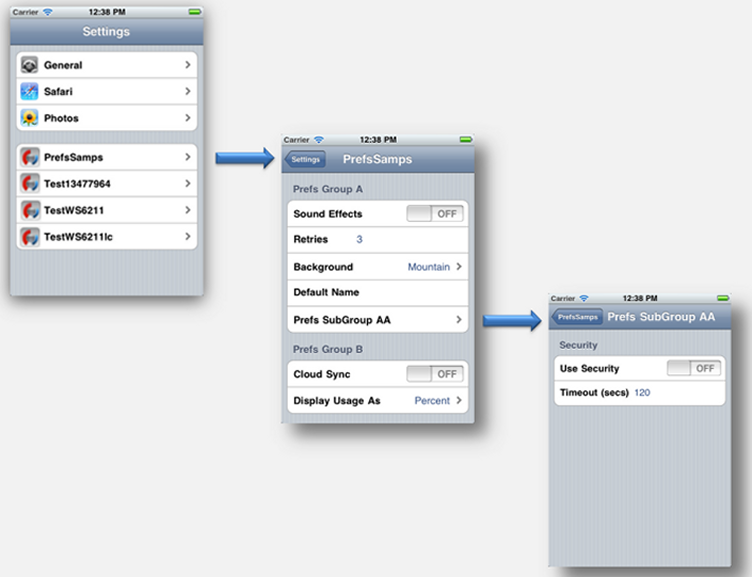 Figure 13-2 shows the PrefDemo application settings page, which you invoke from the general settings page. 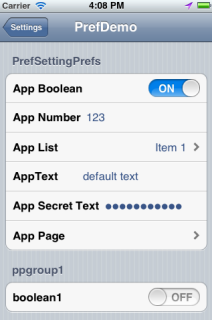 In this illustration, the preference settings page is invoked from the iOS Settings application. 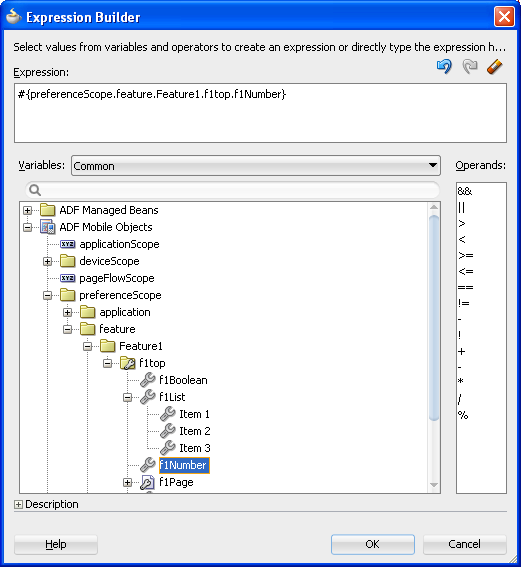 The application feature preference pages, illustrated by App, Feature1 (which is selected), and Feature 2 in Figure 13-3, provide examples of preferences pages constructed from the ADF Mobile Boolean Switch, Input Text, and Output Text components that use EL (Expression Language) to access the application feature and the various <adfmf:preferences> components configured within it. For more information, see Section 13.3, "Using EL Expressions to Retrieve Stored Values for User Preference Pages." In the PrefDemo application, each ADF Mobile AMX preference page is referenced by a single bounded task flow comprised of a view activity and a control flow case that enables the page refresh. The Preferences page of the adfmf-application.xml overview editor, shown in Figure 13-4, enables you to build sets of application-level preference pages by nesting the child preference page elements within <adfmf:preferenceGroup>. The page presents the <adfmf:preferencesGroup> and its child elements as similarly named options (that is, Preference Group, Preference Page, Preference List, and so on), which you assemble into a hierarchy (or tree), similar to the Structure window in JDeveloper. To ensure that the adfmf-application.xml file is well-formed, use the Preferences page's Add dropdown list, shown in Figure 13-4 to construct the user preferences pages. While you can also drag components from the Preferences palette, shown in Figure 13-5, into either the editor, the Source window, or the Structure window, the page's dropdown list presents only the elements that can have the appropriate parent, child, or sibling relationship to a selected preferences element. 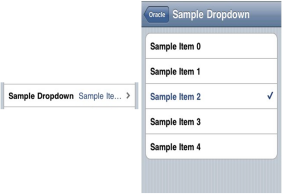 For example, Figure 13-4 shows only the components that can be inserted within the Preference Group element, Oracle Mobile App. The editor also enables you to enter the values for the attributes specific to each preference element. Click Add to create the parent <adfmf:preferenceGroup> element. Enter the following information in to the Insert Preference Group dialog, shown in Figure 13-6. Enter a unique identifier for the Preference Group element. Enter the descriptive text that displays in the user interface. For an example of how this text displays in the user interface, see Sample in Figure 13-1. Click Add to further define the preference pages using the Insert Before, Insert Inside, Insert After options to ensure that the XML document is well formed. The Preference Page component enables you to create a new user interface page. You create a Preference Page using the Insert Before, Insert Inside, Insert After options. 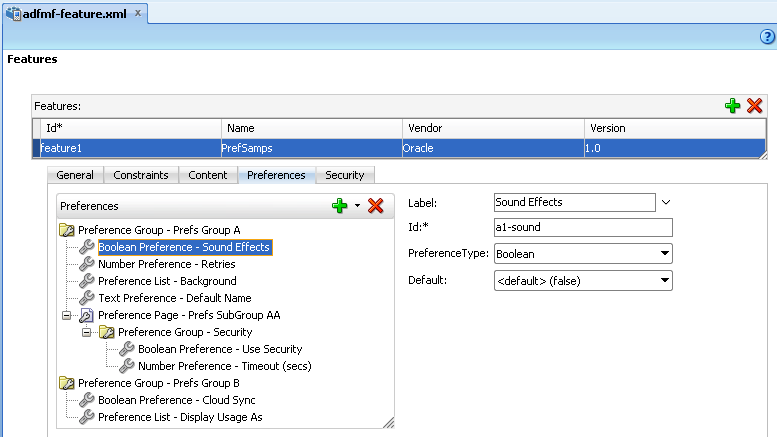 You must create a Preferences Group element. Select the Preference Group element. Click Add, choose Insert Inside (Preference Group), then select Preference Page. As shown in Figure 13-7, the Preference Group is called MobileApp. Enter a unique identifier for the Preference Page element. Enter the descriptive text that displays in the user interface. Create the body of the preference page by inserting a child Preference Group element by selecting the Preference Page, and then first choosing Insert Inside (Preference Page) and then Preference Group, as shown in Figure 13-9. After you define a unique identifier and display name for the child Preference Group, you can populate it with other elements, such as a Preference List element, as shown in Example 13-2. After you define the Preference Page and its child Preference Group components in the overview editor, JDeveloper generates an <adfmf:preferencePage> with attributes similar to Example 13-2. The <adfmf:preferencePage> is nested within a parent <adfmf:preferenceGroup> element. Add a Preference List component to create a list of options. You must create Preference Group as the parent to the Preference List or any other list-related component. Select a Preference Group or Preference Page and then click Add, then Insert Inside, and then Preference List. Example 13-2 shows adding a Preference List as a child of a Preference Group component called Select Your Version. Define the following attributes using the Insert Preference List dialog, shown in Example 13-2, and then click OK. Define a list of items by clicking Add in the Preference Value table, shown in Figure 13-12. You can also remove a preference value by selecting it and then clicking Delete. You can change the order in which the preference values display by selecting the preference value and then using the up- and down-arrows. You can present the user with a default setting by choosing Default. As illustrated in Example 13-2, the default status is defined within the <adfmf:preferenceList> element as default="ENTERPIRSE". In addition to clicking Add, you can add Preference Value components by dragging them either into the Structure window or the Source window. After you add Preference List component to a Preference Group and then define a series of Preference Values, JDeveloper updates the <adfmf:preferences> section with an <adfmf:preferenceList> element, as shown in Example 13-2. See, for example, Example 13-1. Because an <adfmf:preferenceBoolean> element must be nested within an <adfmf:preferenceGroup> element, you must first insert a Preference Group component to the hierarchy. Select a Preference Group element, such as GPS Settings in Figure 13-13. Define the following attributes using the Insert Boolean Preference dialog, shown in Figure 13-14, and then click OK. Accept the default value of false, or select true. When you add a Boolean Preference and designate its default value, JDeveloper updates the <adfmf:preferences> section of the adfmf-application.xml file with a <adfmf:preferenceBoolean> element, as illustrated in Example 13-3. Use the insert options, shown in Figure 13-15, to create a Text Preference, a dialog that enables users to store information or view default text. Figure 13-15 shows creating a text preference within a Preference Group called Security. Create a Preference Group element. Select a Preference Group element. Select Insert Inside and then Text Preference. Enter the following information into the Insert Text Preference dialog, shown in Figure 13-16, and then click OK. Enter the default text value. Select Secret to hide the text preference. When you add a Text Preference and designate its default value, JDeveloper updates the <adfmf:preferences> section of the adfmf-application.xml file with a <adfmf:preferenceText> element, as illustrated in Example 13-4. The Preference Group elements that define a security URL, user name, and password preference setting display similarly to Figure 13-18. Figure 13-18 illustrates <adfmf:preferenceText> elements with a seeded value for the Security URL and an input value for the User Name. 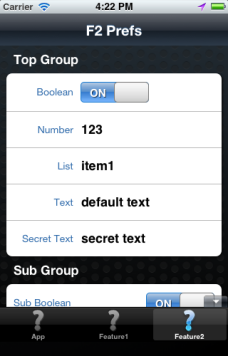 Because the ADF Mobile preferences are integrated with the iOS Settings application, the secret="true" attribute for the Password input text results in the application following the iOS convention of obscuring the user input with bullet points. 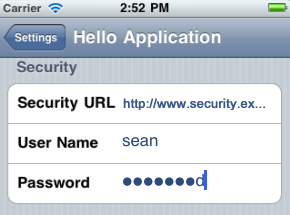 For more information, see the description for the isSecure text field element in Settings Application Schema Reference, available from the iOS Developer Library (http://developer.apple.com/library/ios/navigation/) and Section 13.4, "Platform-Dependent Display Differences." After you deploy the ADF Mobile application, the application-wide preference settings page is propagated to the device's global settings application, such as the Settings application on iOS-powered devices. For more information, see Section 17.2.3.6, "What Happens in JDeveloper When You Deploy an Application to an Android Emulator or Android-Powered Device," Section 17.4.5.1, "What Happens in JDeveloper When You Deploy an Application to an iOS Simulator or iOS-Powered Device," and Appendix C, "Converting Preferences for Deployment." As described in Section 5.13, "Working with Feature Archive Files," you can distribute an application feature independently of its ADF Mobile application by adding a Feature Application Archive (FAR) .jar file containing the application feature to the library of another ADF Mobile application. You then reference the application feature in the application's adfmf-application.xml file. If an application feature requires a specific set of user preferences in addition to the general preferences defined for the consuming application, you can define them using the Preferences tab of the adfmf-feature.xml overview editor, shown in Figure 13-19. You build application feature preferences in the same manner as the application-level preferences, which are described in Section 13.1, "Creating User Preference Pages for an ADF Mobile Application." After you define the preferences in the adfmf-feature.xml file, you then create the actual preference page by creating an application feature that references an ADF Mobile AMX page that is embedded with the Boolean Switch, Input, and Output components described in Section 7.3, "Creating and Using UI Components." When creating an application feature-level preference page, you add EL expressions to the ADF Mobile AMX components, such as the Input Text component in Example 13-5. Figure 13-20 illustrates using the Expression Builder to create the EL expression.The preference itself is designated by the IDs configured for various components in adfmf-feature.xml, such as the ID of the application feature <adfmf:feature id="Feature1">), the ID of a Preference Group (<adfmf:preferenceGroup id="f1top">), and the ID of a preference property (<adfmf:preferenceNumber id="f1Number">). The EL expression may include zero or more group-id and property-id elements. Evaluation of the EL expression involves looking up the preferenceScope object. The evaluation is from left to right, where each token is resolved independently. After a token is resolved, it is used to resolve the next token (which is on its right). Preferences cannot be exposed without the preferenceScope object. ADF Mobile integrates APIs provided for a native UI (such as UIView or UIViewController) to allow certain configurations on iOS platform. When the native UI is initialized, an instance of the ADFSession object becomes available. You can use its getPreferences method to instruct ADF Mobile to provide a listing of the available preferences for the application as defined in the adfmf-application.xml file. As shown in Example 13-6, this method returns a NSArray* of preference property objects that can include the id, value, and label for the preference. This API call ensures that either the end user provided the value for a particular preference, or that the default value of the preference is returned. The ADF Mobile preference pages maintain the native look-and-feel for both the iOS and Android platforms. 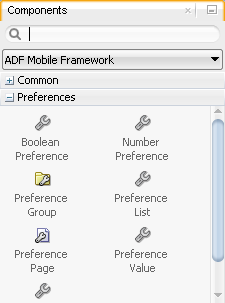 Consequently, the ADF Mobile preference pages display differently on the two platforms. As shown in Table 13-1, preferences display inline on the iOS platform, meaning that the system does not invoke dialog pages. With a few exceptions, the Android platform presents these components as dialogs. The Boolean preference is represented as value pair, such as on and off. Android presents the Boolean preference as a check box. iOS displays the text inline. Android displays the text inline. On iOS platforms, users enter text inline. Android launches an input text dialog. On iOS platforms, users enter text inline, with each character obscured by a bullet point after it has been entered. For more information, see Section 13.1.1.8, "What Happens When You Define a Text Preference." Android launches an input text dialog and obscures each character with a bullet point after it has been entered. iOS platforms display the single item selection list in a separate preferences page. 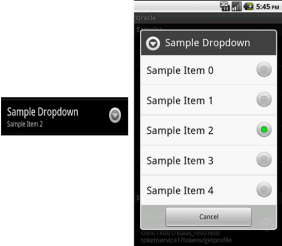 Android displays the single item selection list in a dialog. 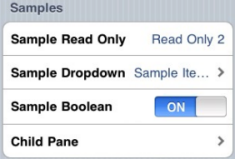 The iOS platform displays the preference elements within their parent preference group. 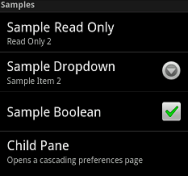 The Android platform displays the preference elements within their parent preference group. iOS launches a child preference page from a preference group. Android launches a child preference page from a preference group. Although iOS and Android platforms have a Settings application, only the iOS platform supports integrating application-level preferences into the Settings application, as shown by the preferences in Figure 13-21. On Android-powered devices, users access application-specific preferences pages similar to the one shown in Figure 13-22 only when the application is running. To minimize user error when entering the Configuration Service URL endpoint in the Configuration Service prompt dialog, you can create a preference for the Configuration Service URL that retrieves a default URL, as shown in Figure 13-23. 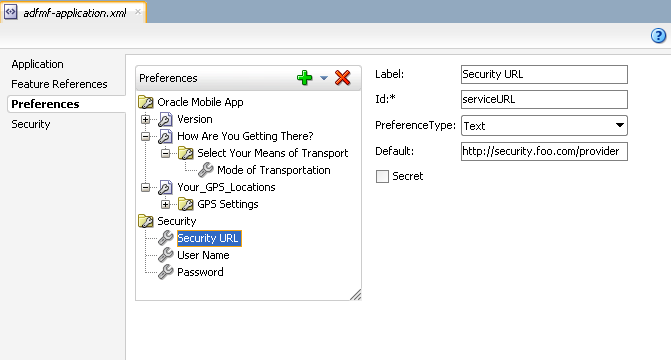 Because the URL populated to the dialog is based on the preference value, ADF Mobile can populate the dialog with a new URL whenever a user updates the preference. Including a default value for the configuration URL, which can be a company-specific URL, is optional. It replaces the value defined for the adfmf-configuration-service-seed-url property in the adf-config.xml file described in Section 10.2, "Using the Configuration Service." Create a Text Preference that includes a default value for the Configuration Service URL and then update the adf-config.xml file to reference this Text Preference. Because the Configuration Service is not associated with individual application features, create an application-level Text Preference. Refer to Section 10.2, "Using the Configuration Service." 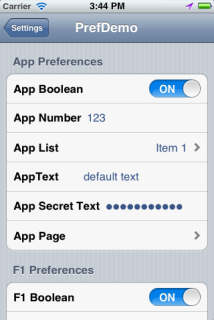 Create a Text Preference within a Preference Group as described in Section 13.1.1.7, "How to Add a Text Preference." Enter the Configuration Service URL as the default value, as illustrated in Example 13-7. In the source editor for the adf-config.xml file (located in ADF META-INF directory in the Application Navigator), add the adfmf-configuration-service-seed-url-preference property. Reference the id values for the Preference Group and the Text Preference that are configured in the adfmf-application.xml file, as illustrated in Example 13-7. Example 13-8 illustrates using the format of application.Configuration_Service.seed_URL to create this reference. Including the use-configuration-service-at-startup property may cause problems on Android-powered devices, because users cannot access application-level settings before starting an ADF Mobile application. If you use this property, define a default URL in the Text Preference. The checkForNewConfiguration method prompts ADF Mobile to check the adf-config.xml file for the referenced Text Preference defined in the adfmf-configuration-service-seed-url-preference property. 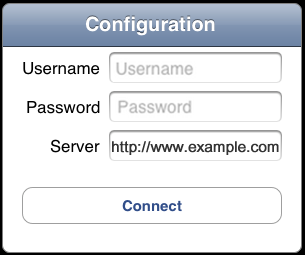 If the preference includes the default value defined for Configuration Server URL, then ADF Mobile populates the Configuration Service prompt dialog with this string, as shown in Figure 13-24. If the preference does not include the string (which may be the case for ADF Mobile applications deployed to, but not yet started on, Android-powered devices), ADF Mobile instead populates the field with the hard-coded value defined for the adfmf-configuration-service-seed-url property. For subsequent checks (that is, when the user credentials are cached in the local store), ADF Mobile populates the dialog with the Text Preference's default value as the Configuration Service URL. For more information, see Section B.2.3, "checkforNewConfiguration." Although the runtime fetches the default value for the Text Preference if a URL is not present in the dialog, this behavior varies by platform. 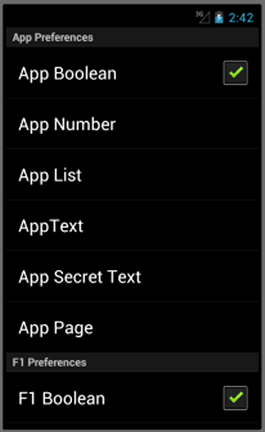 The first time a user runs an ADF Mobile application on an Android-powered device, ADF Mobile cannot populate the Configuration Services prompt dialog using the preference value. Instead, it uses the string defined for adfmf-configuration-service-seed-url property, because the runtime has not yet populated the preference with the value defined in adfmf-application.xml. Further, users cannot update the application-specific settings with this URL if an application is not running. Only after the application has been started can a user update the preference with the Configuration Service URL, which will be used the next time the ADF Mobile application starts. For more information, see Section 13.4, "Platform-Dependent Display Differences." Because of these device- and state-related considerations, define a default URL value for the Text Preference, or include both the adfmf-configuration-service-seed-url and adfmf-configuration-service-seed-url-preferences properties in the adf-config.xml file.